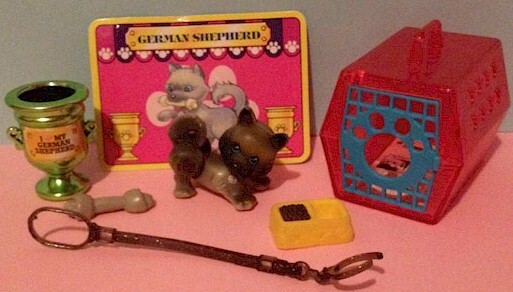 The Fancy Poodle and Brave German Shepherd were not released in Europe. 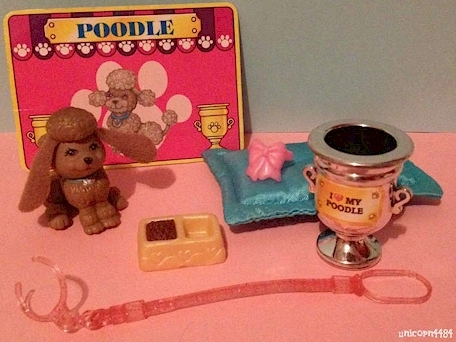 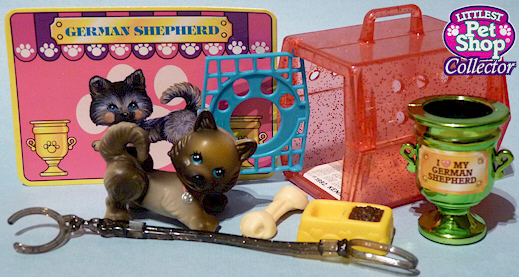 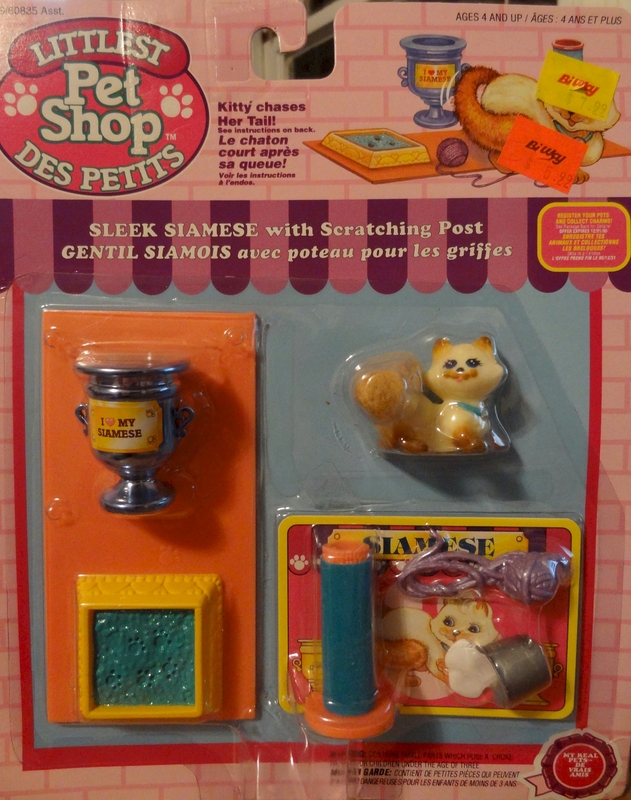 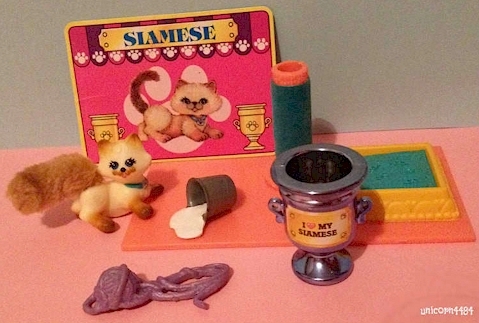 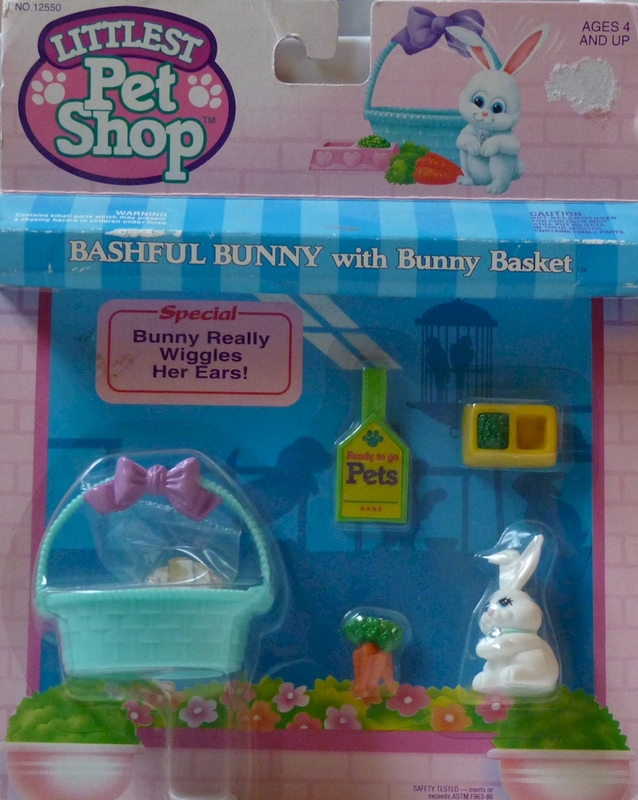 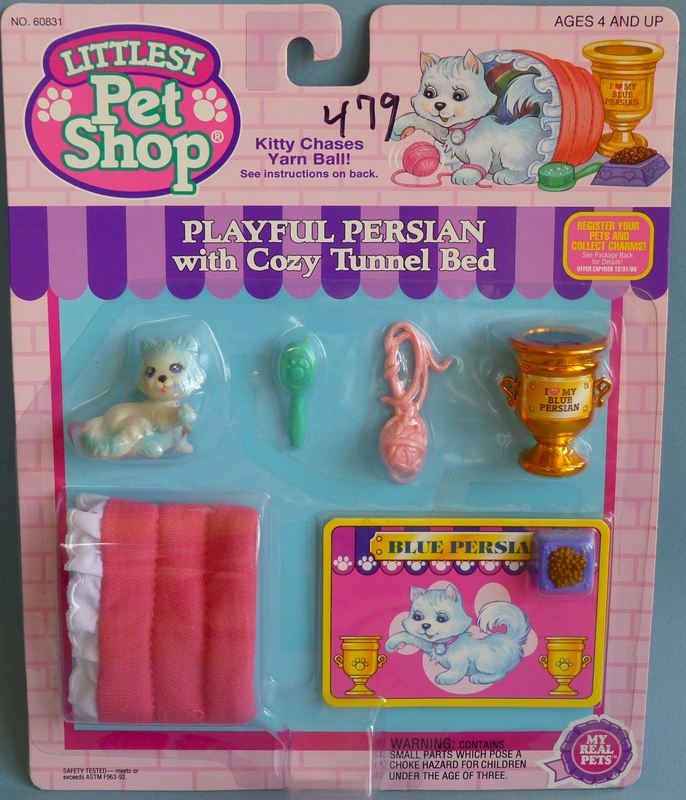 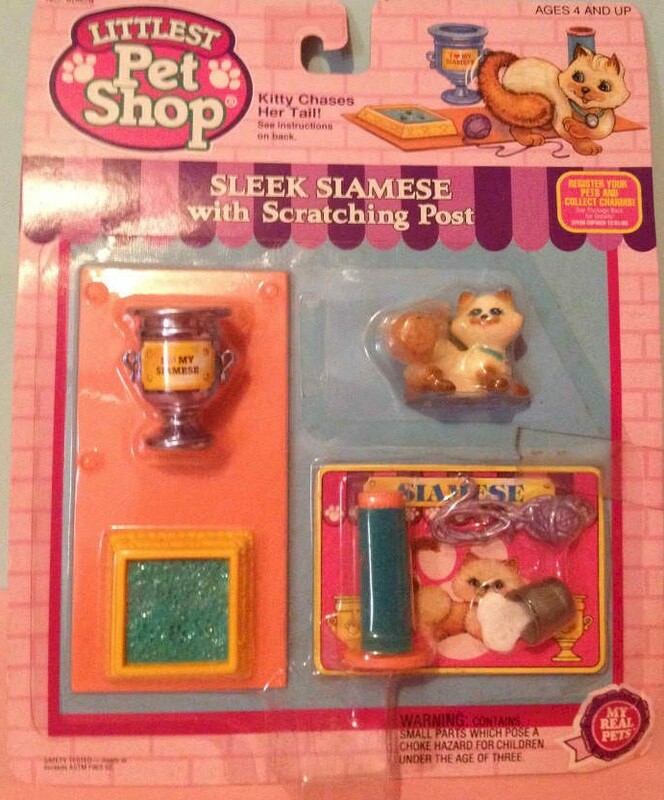 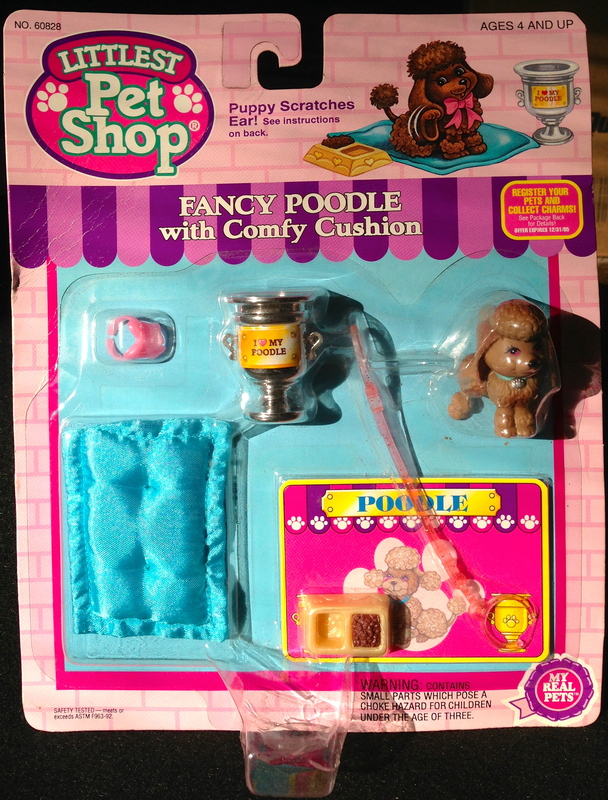 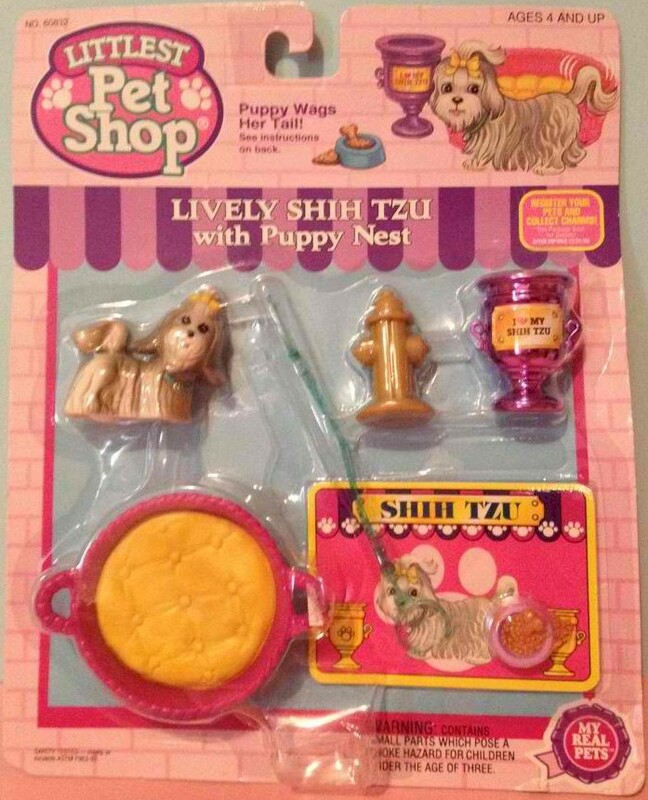 All of the other sets in the My Real Pets assortment were released both in the US and abroad. 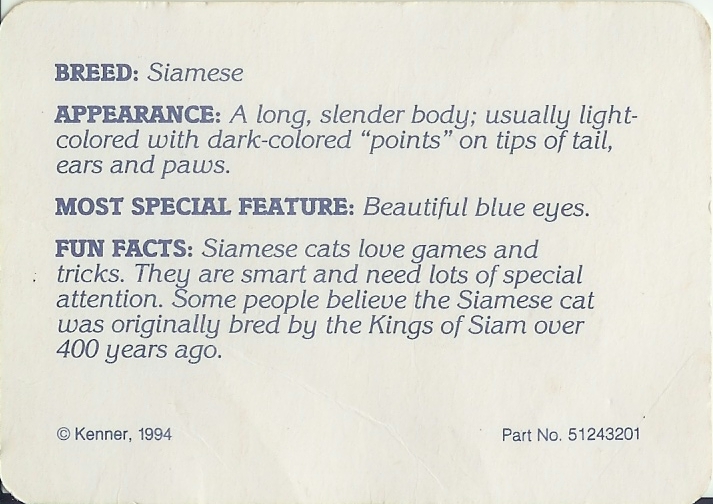 In the US, each My Real Pets set was sold with one of two fact card variants. 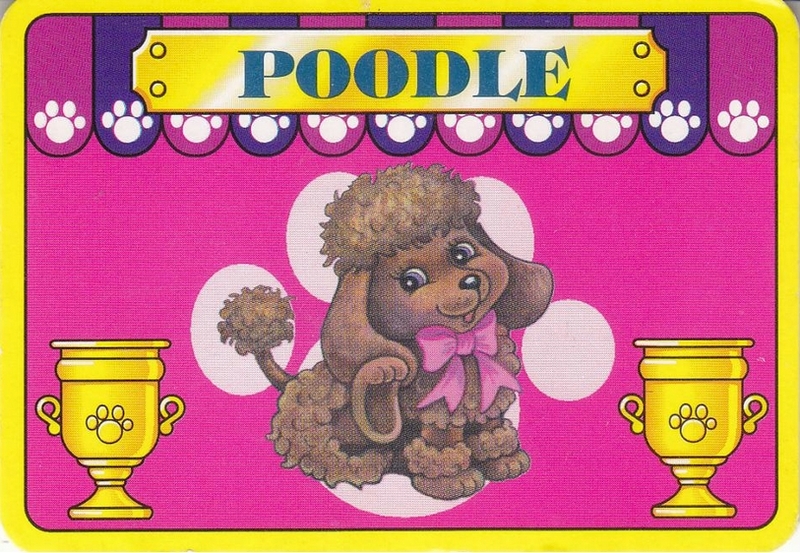 One card features a "Cartoon" depiction of the pet, and the other features a more "Realistic" depiction. 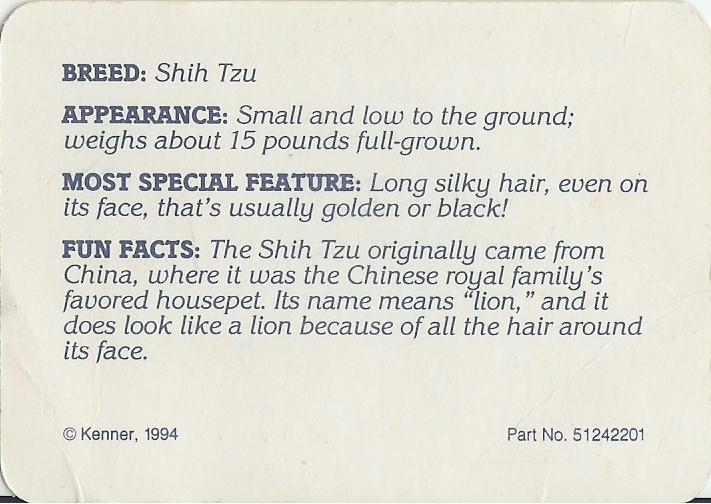 The Realistic fact cards appear to have only been released with US sets. 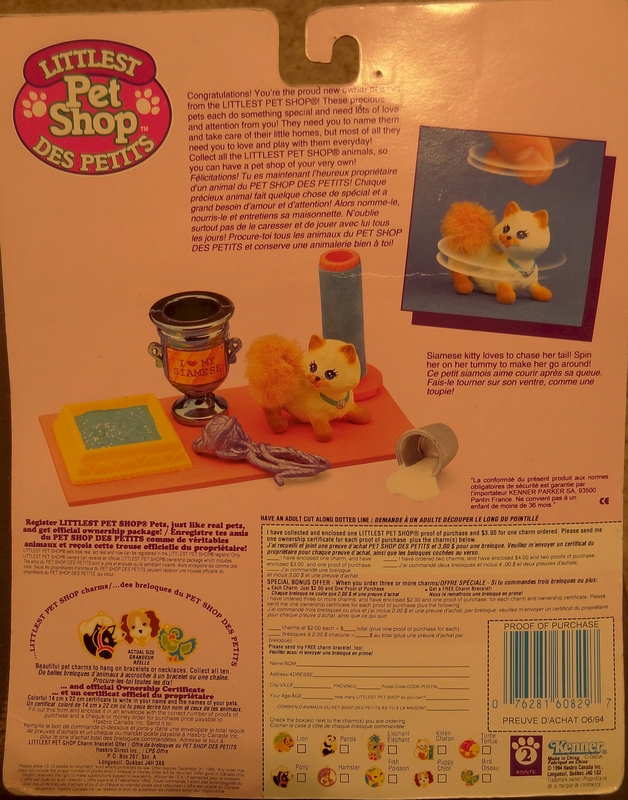 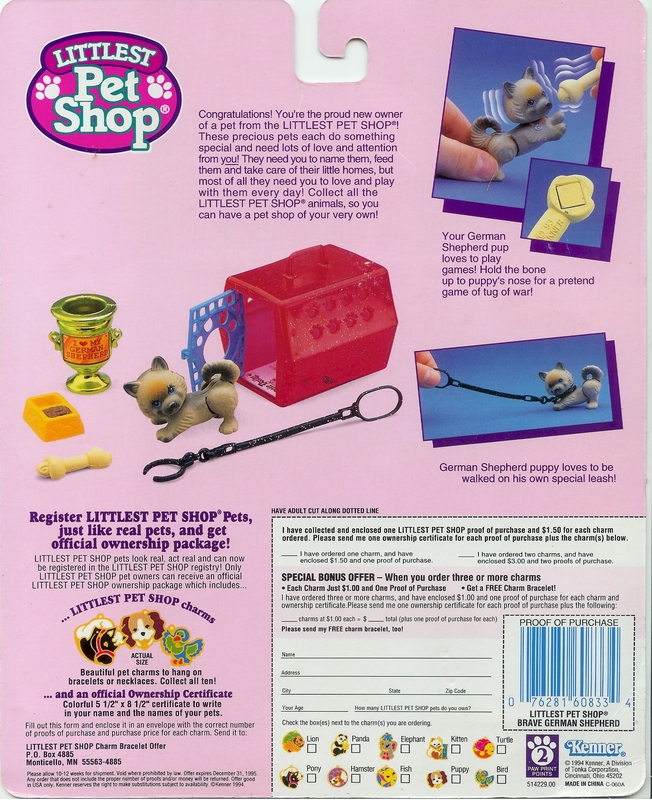 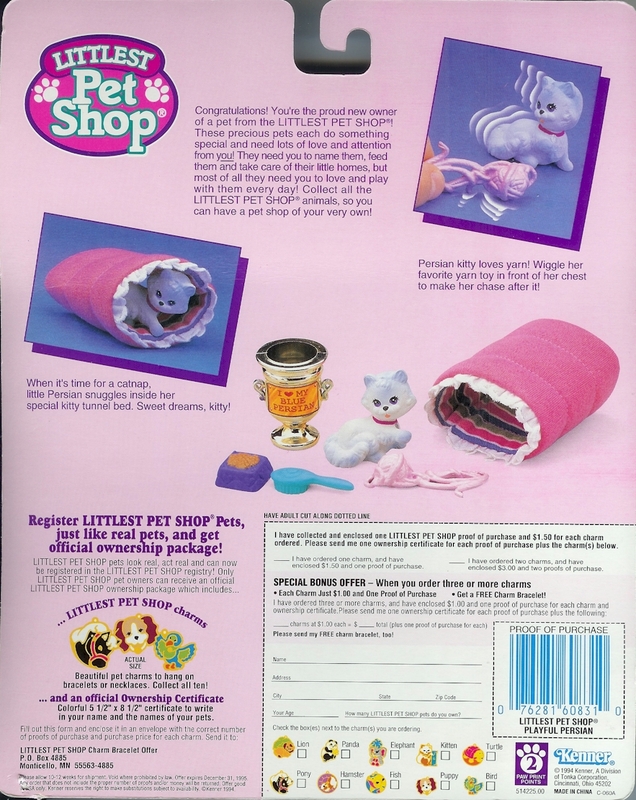 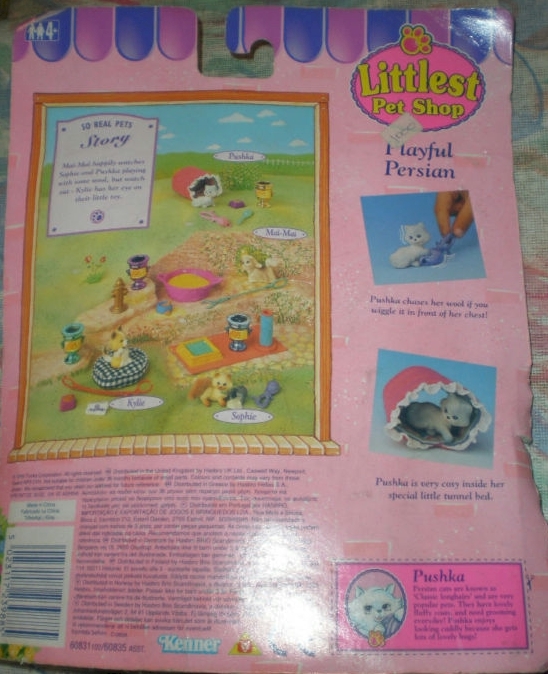 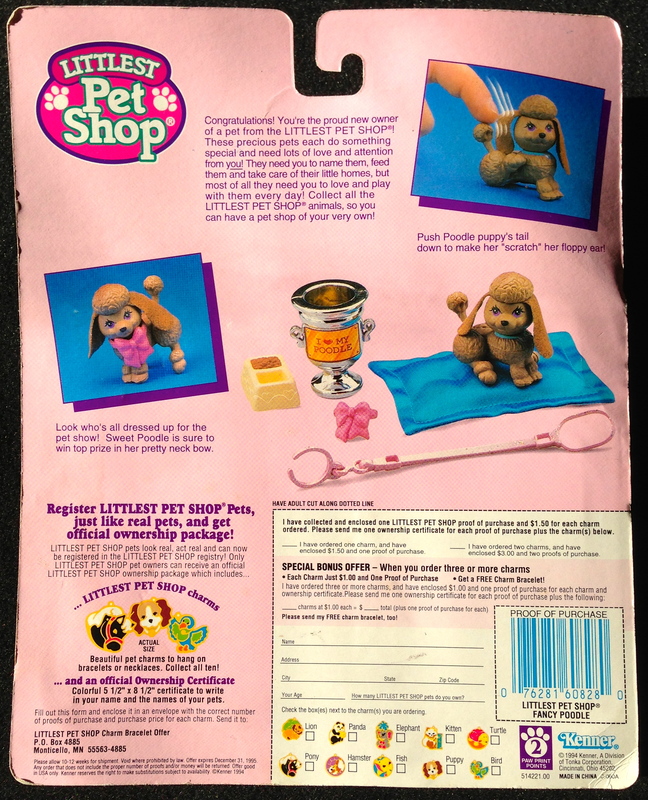 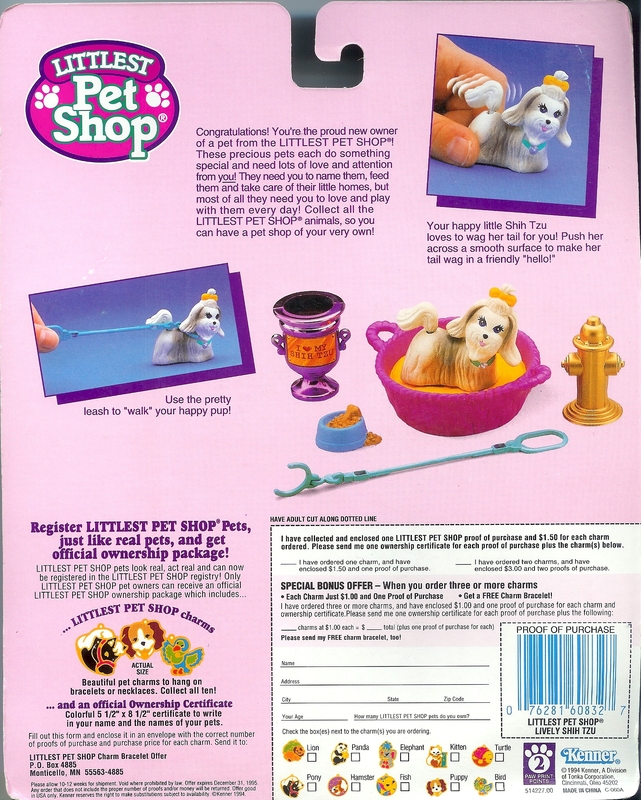 International releases of My Real Pets sets included a "Family Album" pamphlet in: the UK (and Greece, which used UK packaging), Belgium & the Netherlands, Italy, and France (and maybe in Spain?). 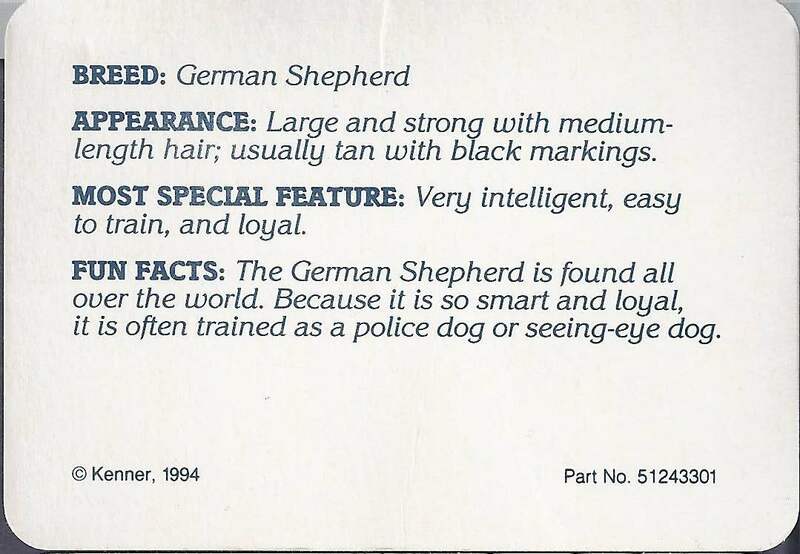 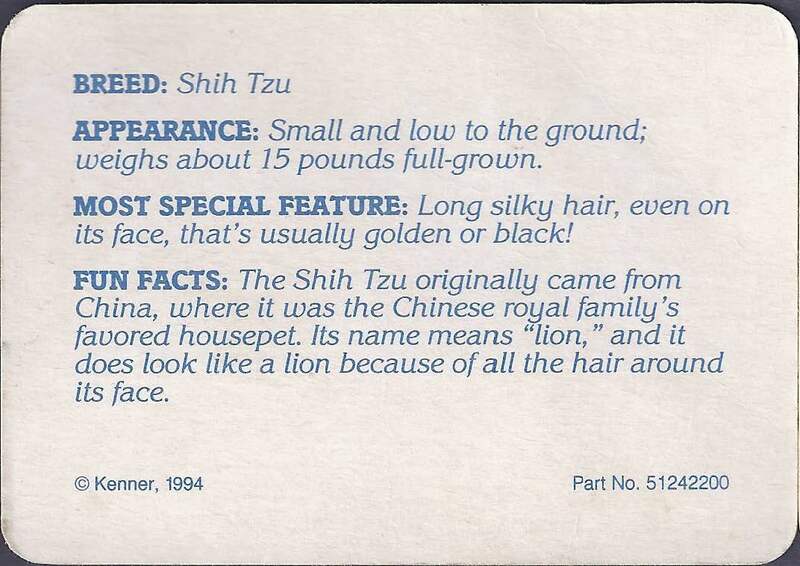 Other international releases of My Real Pets sets instead included a Cartoon fact card that had no text on the back in Germany and Japan. 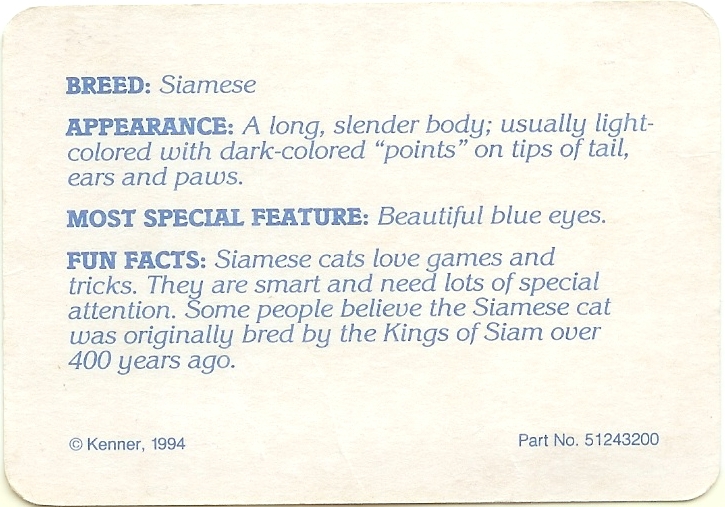 In Australia (which used American packaging), these sets were released with Cartoon fact cards with text on the back. 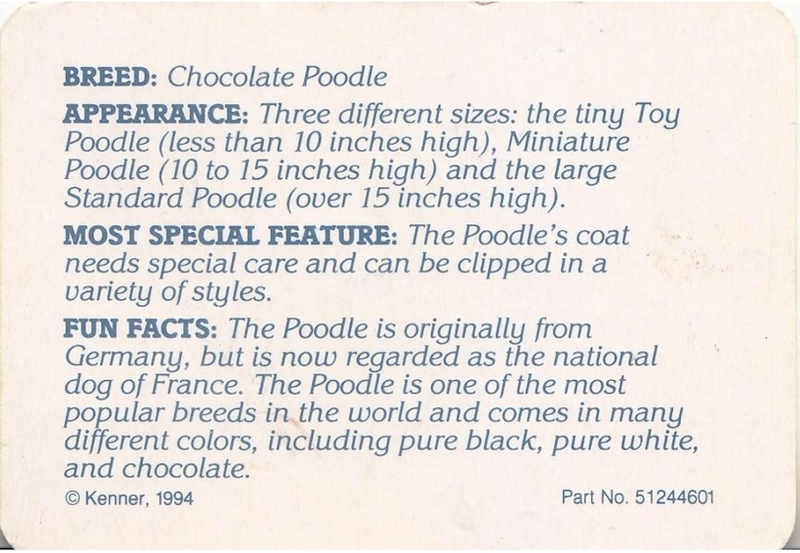 More information is needed on releases in Mexico and Canada. 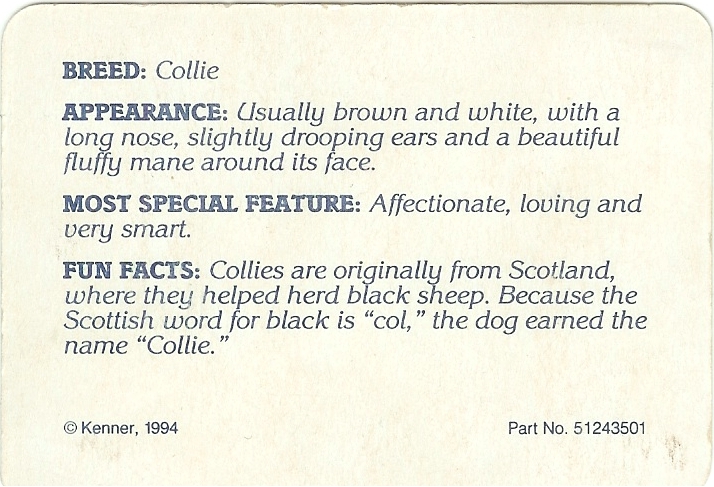 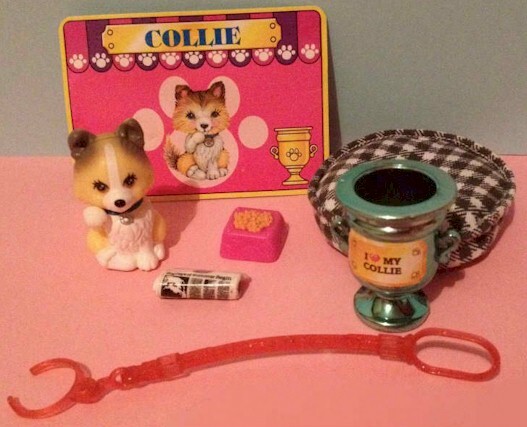 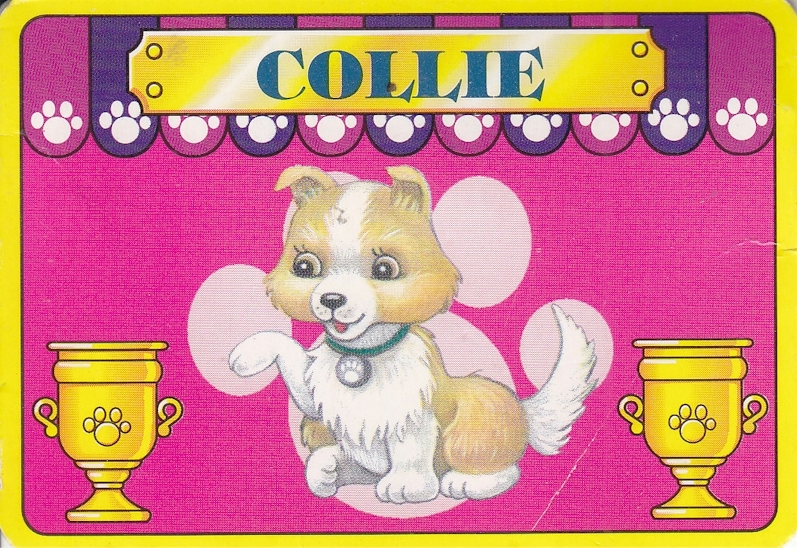 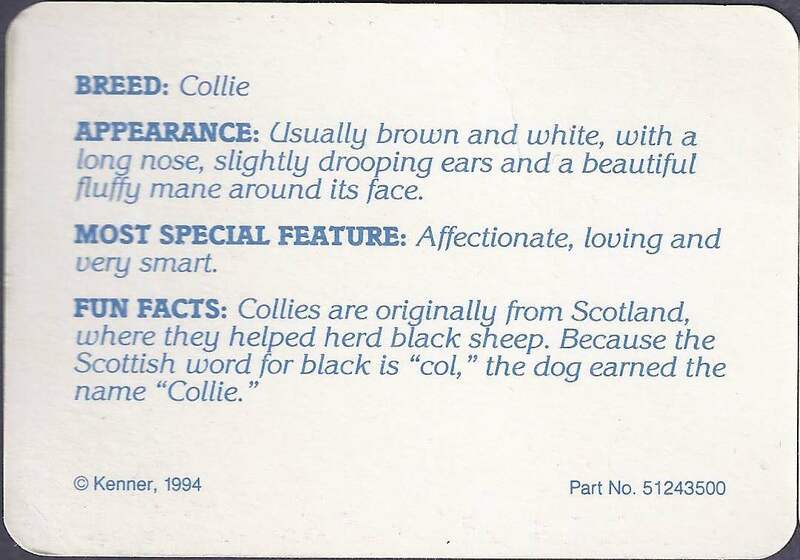 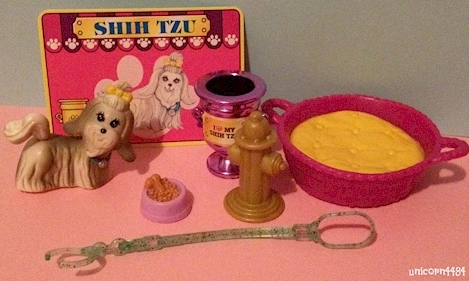 In releases from the US, Canada, Germany, Australia, and Japan, the sets' trophies featured the text "I love my [Collie, etc.]". 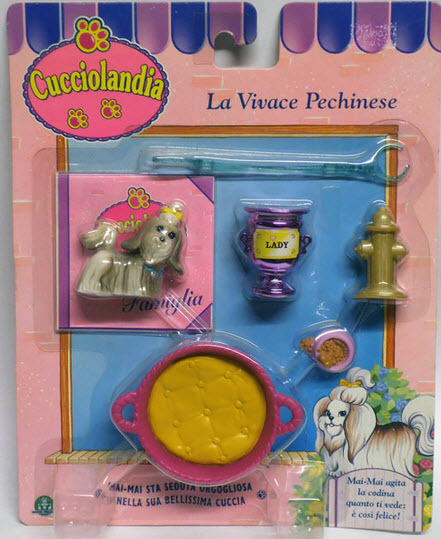 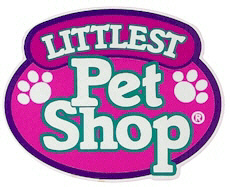 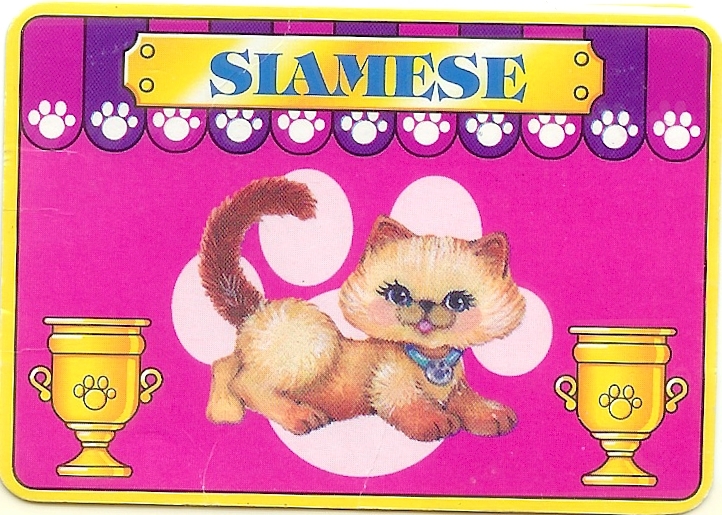 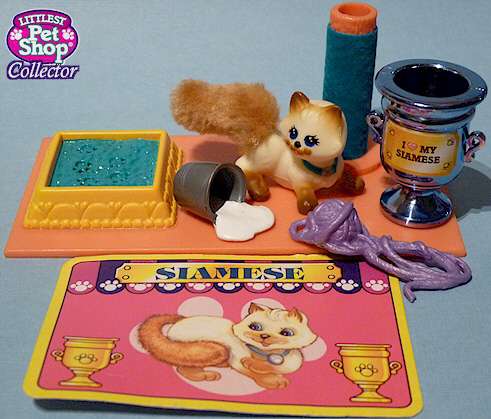 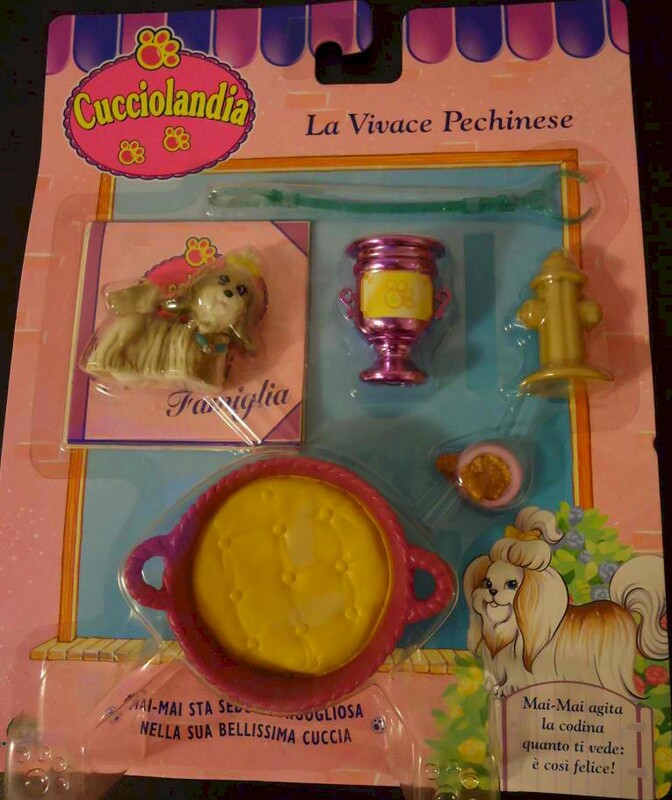 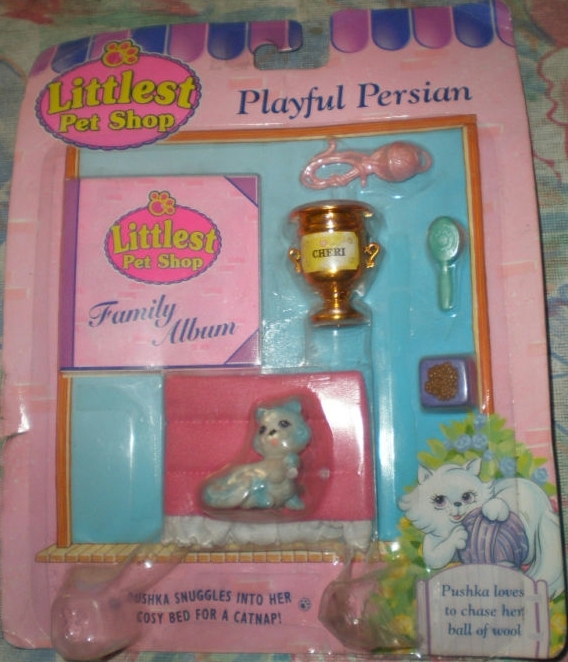 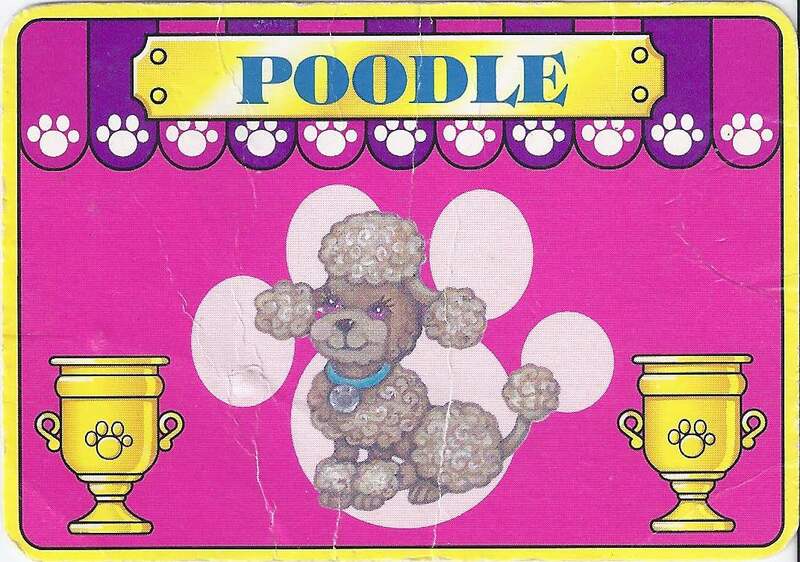 Sets released in France and the UK contained a trophy that had a sticker with the pet's name on it. 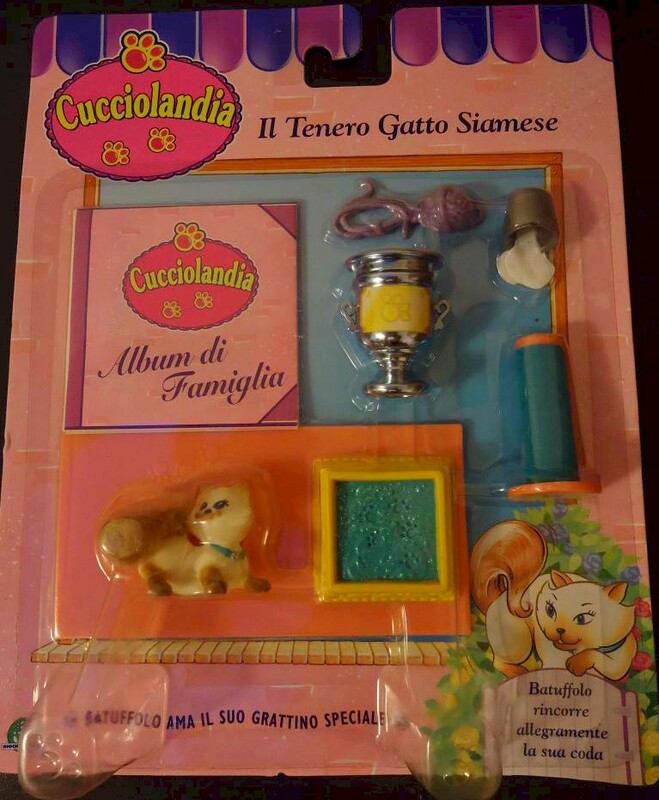 In Italy, the trophy had two variations: 1) paw print only (no name) on sticker; 2) name on sticker. 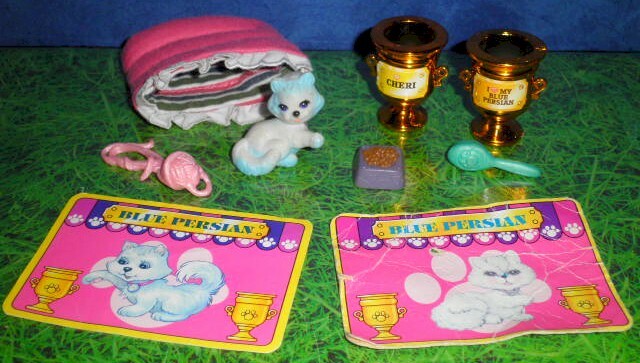 Trophies, left to right: UK/French; US/etc.  3.625 in. 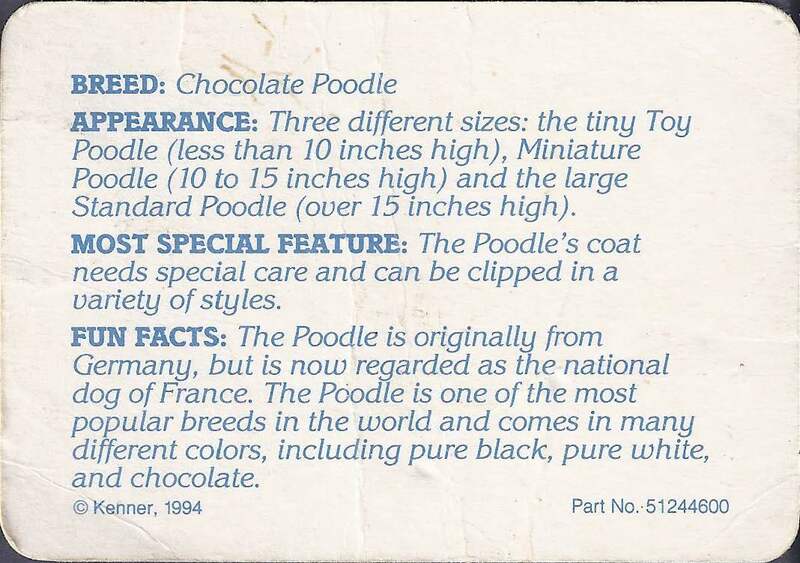 x 2.5 in. 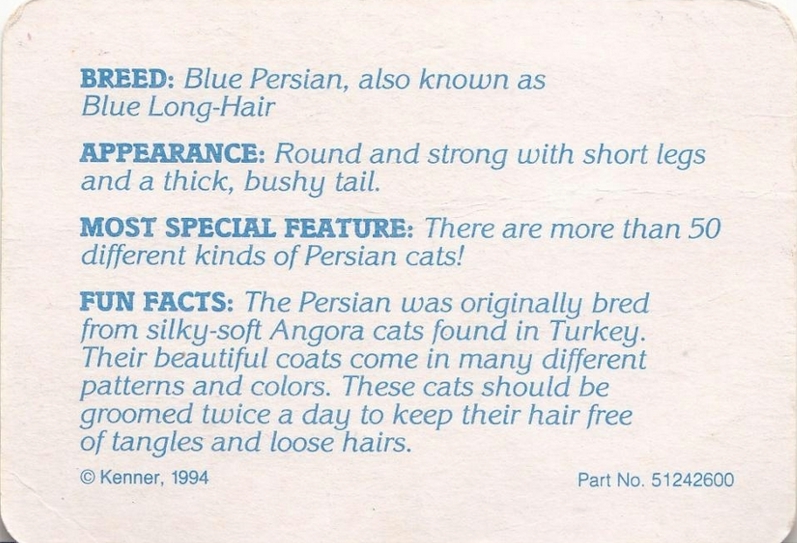 -Family Album pamphlets, translated into each country's respective language, were included with sets released in: Belgium/Netherlands, France, Italy, and the UK (and maybe Spain and Portugal?). 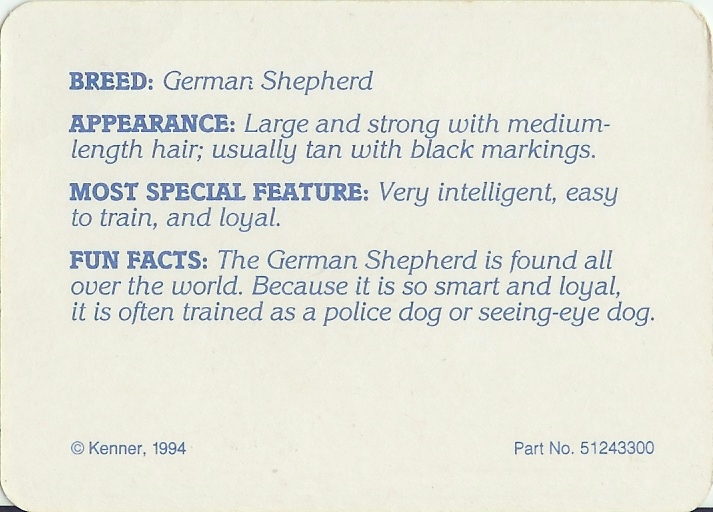 -Cartoon fact cards, instead of pamphlets, were included with sets released in Germany. 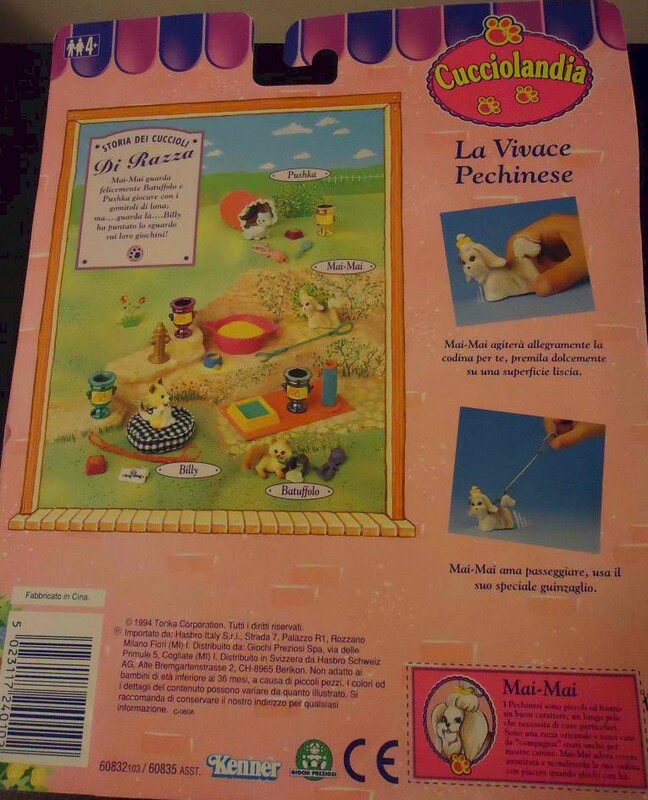 -It reads "Cheri" in releases from the UK and France. 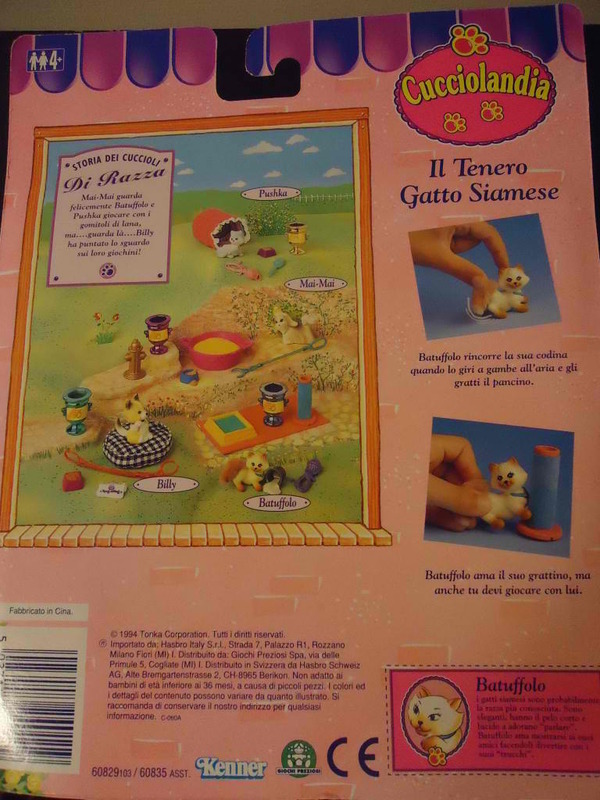 -In releases from Italy, it features either 1) the pet's name or 2) a paw print (no name). 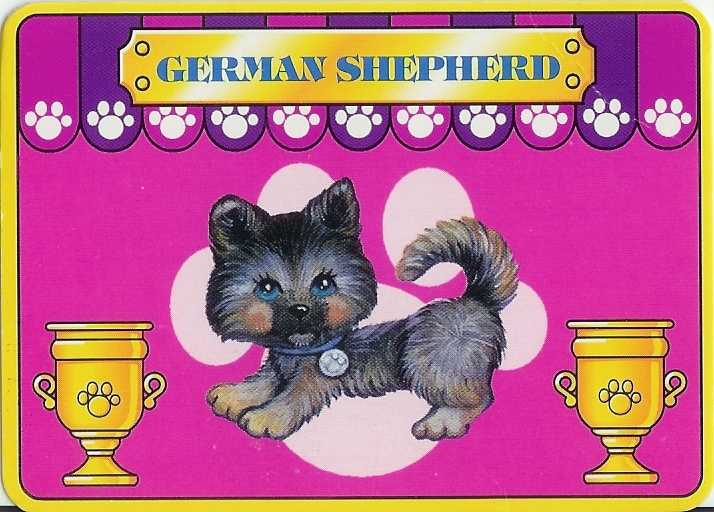 The international trophy is identical to the US trophy in Canada, Japan, Mexico, and Australia. 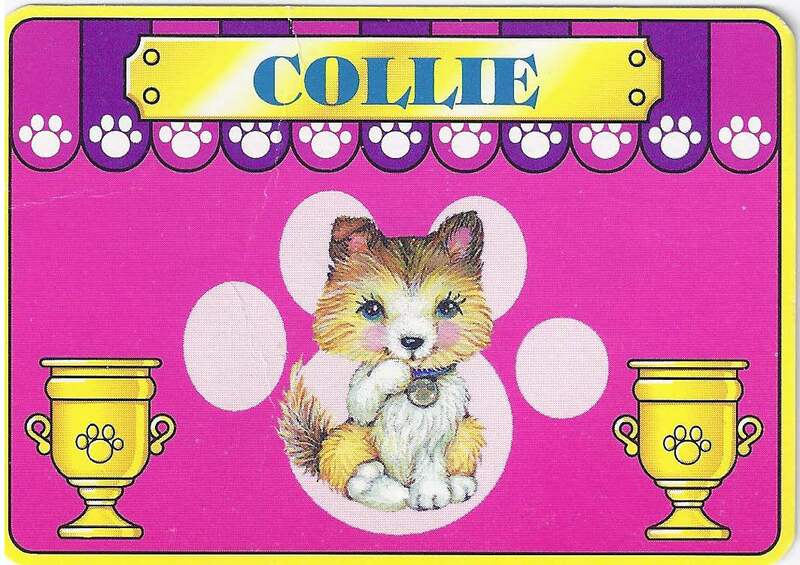 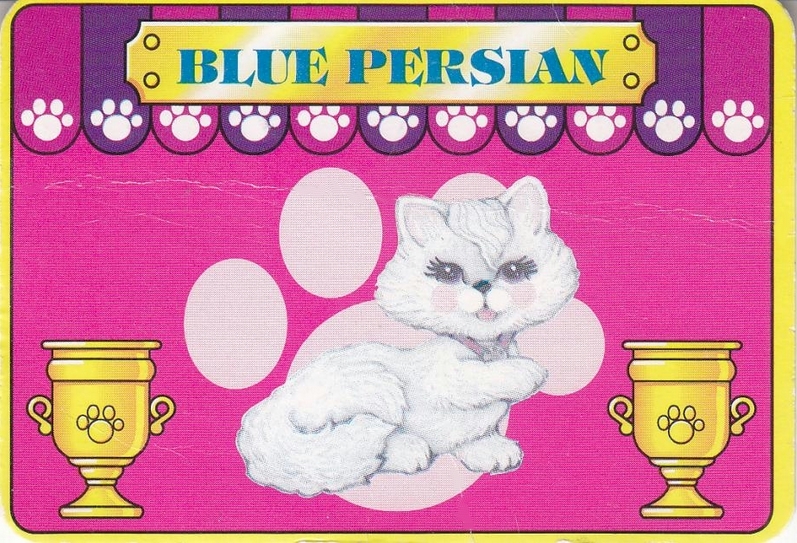 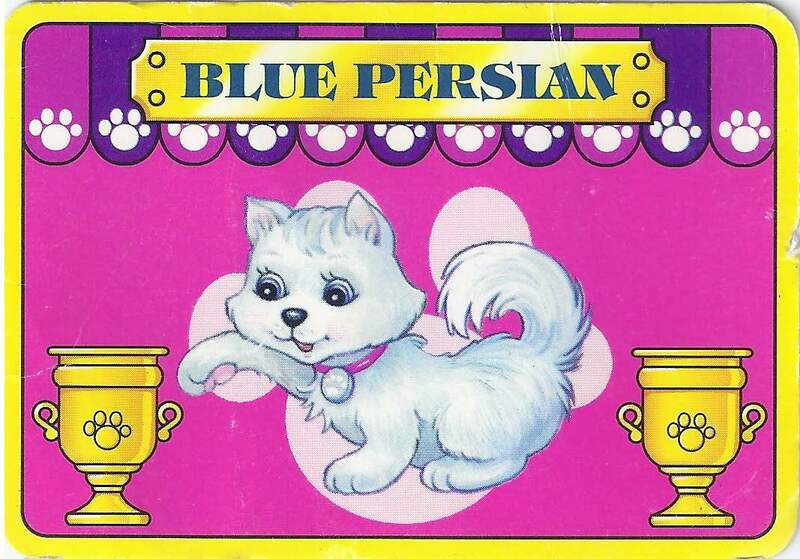 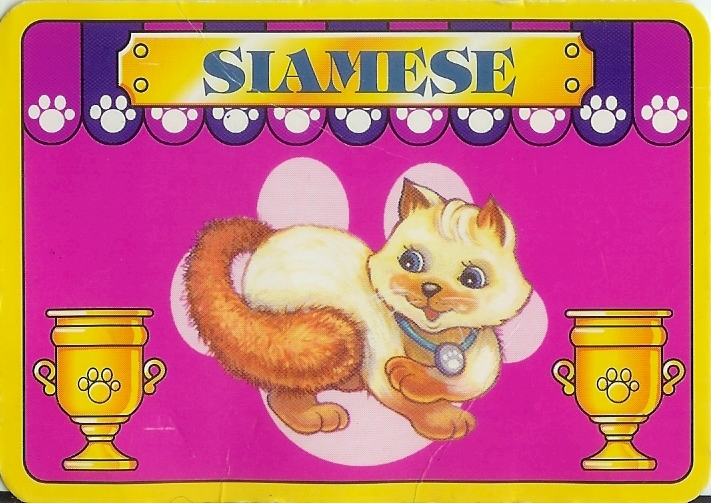 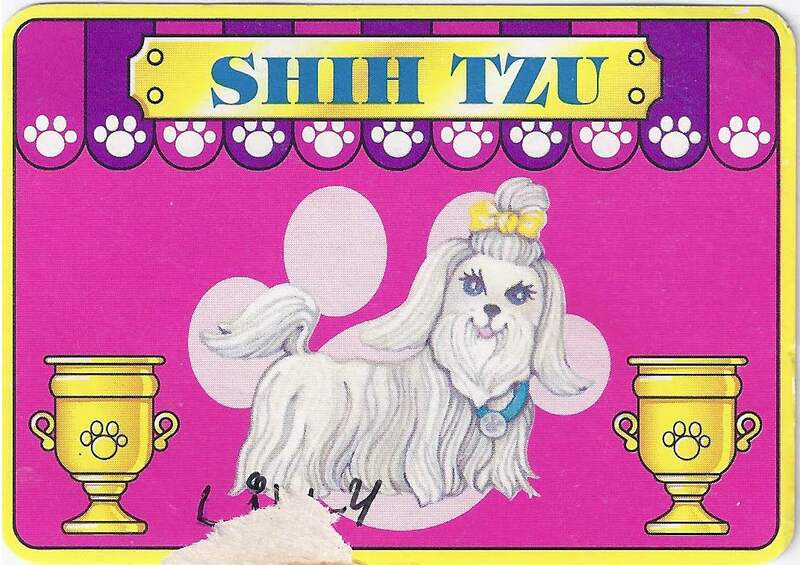 -European backcards featured a character card cut-out of the pet's character. 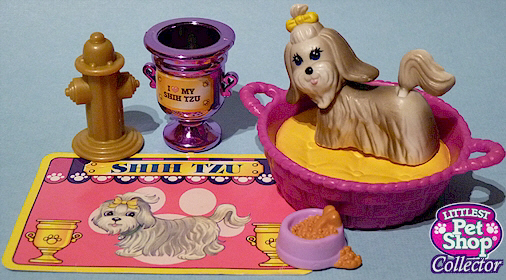 -It reads "Tammy" in releases from the UK and France. 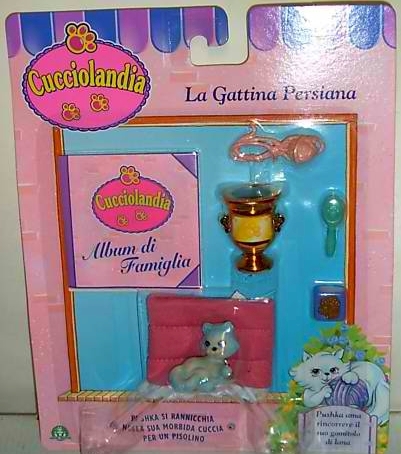 Trophies, left to right: Italian; UK/French; US/etc. 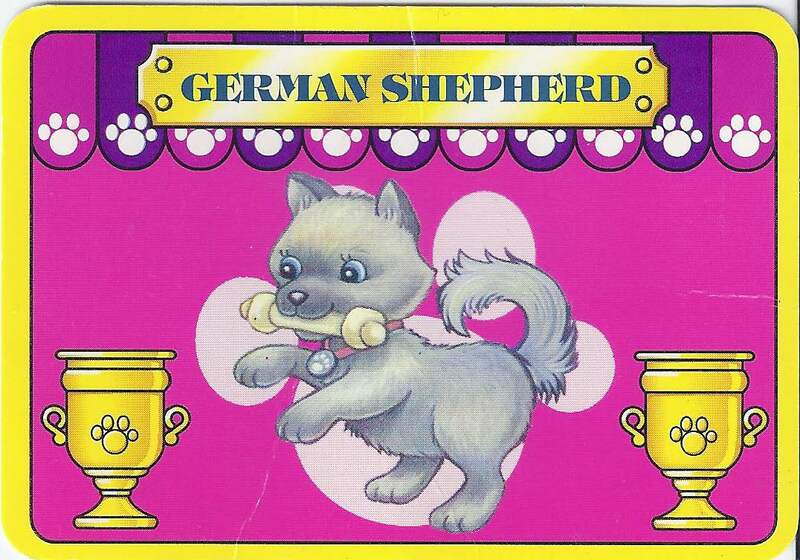 -It reads "Benni" in releases from the UK and France. 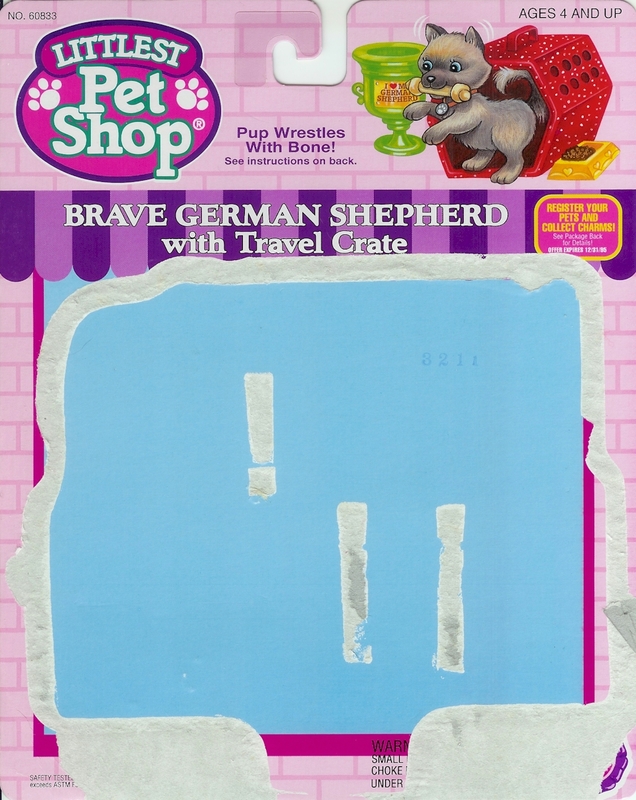 -Newspaper does not have text. 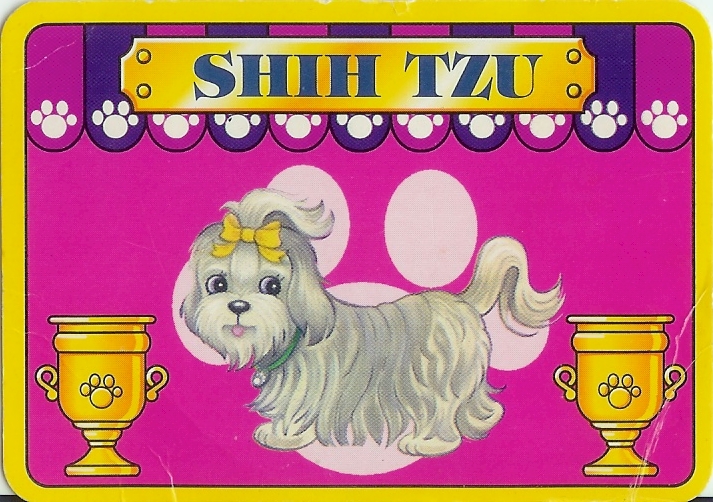 -Blue collar with silver paw print She wags her tail as she "walks"
-It reads "Lady" in releases from the UK and France.